Appropriately, this week our color was black. I actually had more difficulty with this color than I anticipated. First I was trying to think of a way to "experience" black. We don't have black Play Doh, couldn't find black sorting objects, DID have a black puzzle, but the closet is low on black objects. Then as I was trying to put black items in the color box, I found many things with some black here or there, but total black was few and far between. For the box I found three hand puppets: Shamu the whale, a black bear, and a black spider. We did have some fun with the spider. I'm not sure if the color box is getting old or if they had trouble finding items, but I was the only one to add items this week. For o ur color book we colored a black kitten. 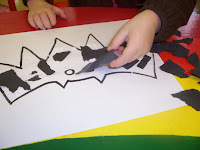 Our manipulative page is a black bat that the children do paper ripping for. I give them the shape, we cover it with glue, then they rip black paper into pieces to cover him and make him black. This is VERY difficult for many of the children, but also very good for their development. They actually try to pull the paper apart and become frustrated when it doesn't happen. The activity can take longer than our usual manipulative activity. Because of that and our parade, we were a bit off schedule. 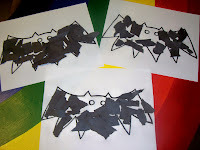 So we will be doing the black bat on Tuesday morning. O ur snack was--again had trouble--raisins. I know they are not literally black, but they give a good black appearance. I thought about Oreo's, M&M's, or chocolate chips, but I didn't want to add to the sugar content for the week. I guess I could have done black olives, but I'm not sure how many would have been eaten. So, this week I learned that next year for black I have some extra work to do to be ready, and maybe some shopping to do!